Blue Devils B took top honors at the World Championship Quarterfinals in Michigan City, Ind., Tuesday, Aug. 4 with a score of 93.55, earning an engraved spot on the new Michigan City Quarterfinals Champion Trophy for a second year. "I definitely had chills and goose bumps. There were times in the show where I almost cried. Everyone was hyping off the energy. Ames Field is a great venue to perform at—the new turf field was phenomenal. All the hard hours of practice we put in have paid off," said Blue Devils B drum major Andrew Wood, a fifth-year member of the corps. Fellow Devils drum major, Eddie Pineda, agreed that the corps' performance on Tuesday was amazing and said the group is looking forward to heading to Indianapolis as the World Championships move onto Lucas Oil Stadium. "We're going to keep working as hard as we can until the finish line, because that's what champions do. I think this group is definitely capable of that," he said. The Santa Clara Vanguard Cadets took second place with a score of 92.25, putting them behind Blue Devils B by 1.3 points. The spread between the two corps was strikingly similar to last year's results, where BDB bested the Vanguard Cadets by 1.35 points at the Quarterfinals. 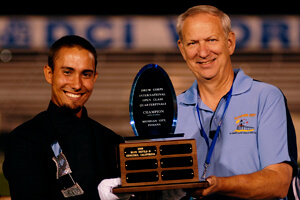 The Vanguard Cadets ended up taking home the title in a come-from-behind victory at the World Championship Finals in 2008, but director Robert Ripley said though shaping up to be similar, last year's results are not really on his mind. "It's hard to compare year to year. 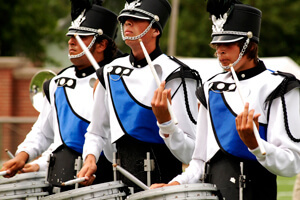 This is a completely different corps," he said, explaining that no matter the scores or placements the corps receives, they strive for consistency in rehearsals leading up to the World Championships. "We have one of the better designed shows this year in the history of Vanguard and it's certainly a fan favorite," he said. Citations came in third at the event with a score of 91.20. Teal Sound (4th, 89.10) pulled ahead of Capital Regiment (5th, 87.60), Revolution (6th, 87.55) and Raiders (7th, 87.30) with their night club themed show, "Beyond the Velvet Rope," which utilizes an entire rock band performing on the front sideline. Earning eighth place with a score of 85.60, was the Oregon Crusaders. Julie Lilliquist, a first-year member of the Crusaders, said the excitement created by the corps during the performance Tuesday evening was a highlight. "I think we had our greatest run yet, and that's the most important thing. We've been working hard for so long, and it's great to see it all come together. I feel like we accomplished everything we wanted to," she said. Looking ahead to the next World Championship events on the schedule, she said, "Personally I'm just excited about performing in Indianapolis later this week. That's what I came here to do and that's what I love to do. " Ninth place went to Velvet Knights with an 82.10, followed by Memphis Sound (10th, 81.05) and extremely close behind came Legends (11th, 81.00). 7th Regiment positioned themselves in 12th with a score of 80.10, which bodes well for a shot to perform at the World Championship Finals on Saturday. Trumpet player Max Madore, who plays King Arthur in the show, "Excalibur," said Tuesday's performance was the corps' best by far. "It's a fun show to perform. It has a lot of character and all sorts of nuances that you don't usually get in other performance settings," he said. 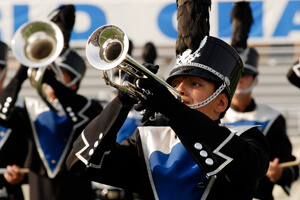 In his third season marching with a drum corps. "The camaraderie and the overall feeling of working with one mind is what has improved the most this season," he said. "Everybody's thinking about the same things at the same times and we're really connected." Music City (13th, 79.45) topped the Colt Cadets (14th, 77.85), with Dutch Boy taking 15th with a 75.30. Racine Scouts (16th, 74.30) and Les Stentors (17th, 68.00) earned the last two spots that come with the opportunity to perform in the next round of competition. The Blue Saints and Spirit of Newark/New Jersey just missed the cut to continue to the Semifinals at Lucas Oil Stadium Friday in Indianapolis. 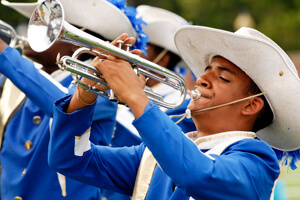 The two corps will, however, have the chance to perform an exhibition of their musical programs at the event. With the production "The White Show," Spirit of Newark took 18th place earning a score of 65.45. Latonya Adams, a 16-year-old color guard member, learned about drum corps in seventh grade when Spirit of Newark came to her school. "I worked as a roadie for one year and then while watching the guard, I said, 'I want to do that.'" Over the course of the season, she said she built strong ties with her guard friends. "They're like family now. And I'm not sure what I'm going to do when I get home," she said, laughing. Their show, based on the "psychedelic 60s," utilized a 3D effect during the drum solo. 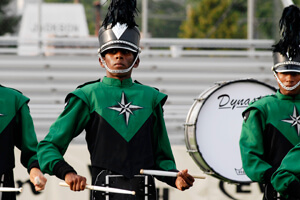 The guard uniform tops are a swirl of colors and pop when viewed with 3D glasses. Adams said they were picked specifically with the glasses in mind. With such fond memories, Latonya was adamant, "I'm coming back next year."